Aves Noir | Scarecrows – Scary or Wary? Scarecrows – Scary or Wary? The scarecrow is commonly associated with modern references like the Wizard of Oz and Batman, but its original purpose was to discourage birds such as crows or magpies from disturbing and feeding on recently cast seed and growing crops.The earliest reference is in Japanese lore (circa 700 AD) in which a Kuebiko is depicted as adiety which knows everything of the world from its unmoving location among the fields. Yet, maybeall is not asit appears. First, was the scarecrow reallyonly a utilitarian object used for its stated purpose? Today we are learning anew just how intelligent crows and ravens are. As we’ve seen in studies documented by PBS since 2009, (and again just last night in Nature’s Crows special), Crows and their cousins never forget a face.Farmers skilled in the art of olde probably knew this.After all, if a crow can remember you and I, they are quite capable of recognizing the ol’ tattie bogle that hasn’t moved an inch since he showed up. They are also not fooled by plastic owls. So why the continued use of bogeymen? “Perhaps one possible purpose of the scarecrow was notjust to scare away birds, but to mark the land as belonging to the farmer. Or if a serf, to the land’s lord.Stay out!The idea of hanging bodies as a warning was used in the past. The ancient Romans left crucified prisoners to send a message to their population. The infamous Vlad the Impaler impaled prisoners of war as a gruesome warning. The scarecrow, impaled and crucified, could have served a similar, if less graphic, purpose.Call it a Scareman. In Norse mythology, Odin hung upside down from the world-tree Yggdrasil in order to attain enlightenment. He had to suffer greatly for his wisdom. After nine days Odin achieved his goal and discovered the Runes, died and was reborn, freed from the tree but at the cost of one of his eyes.Sufferingbefore spiritual growth is a theme in many religions. 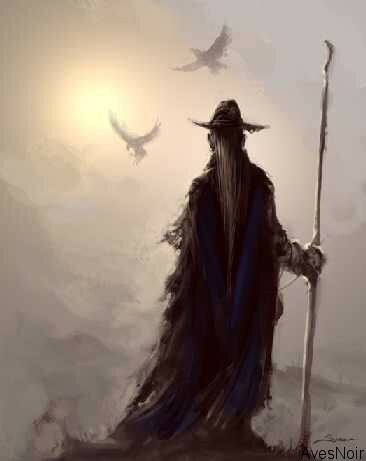 To complete the circle, Odin was linked to his two ravens, Huginn (thought) and Muninn (memory), which travel the world giving Odin information. Here ravens represent the power of the mind as they perch on Odin’s shoulder whispering in his ears. As crows perch on the scarecrow, grantingthem theadvantage of sight over the fields. Fast forward a bit to the dark ages. In folklore from the British isles, crows were considered omens of doom and death. If crows were considered bad omens, then using a scarecrow to banish them seems to have a metaphysical as well as a practical purpose. These symbolic supernatural attributes are a reflection of the genuinevirtues of the crow.They are mischievous,enterprising, adaptive, and highly communicative, and the scarecrow represents not the will of man to ‘scare’ them away, but that man was scared of the crow. As the ages wear on, methods change, and scarecrows have joined the ranks among the legends and folktale pasttimes, existing only as lonely halloween decorations. Today, highly reflective aluminized PET film ribbons are tied to the plants to create shimmers from the sun, a futuristic approach to pest problems, however we all know how much corvids like shiny things.